I fish a couple small streams properly named creeks because at summer levels you can’t navigate them with a toy boat. After a good rain that all changes. Water spills over to low swampy areas. 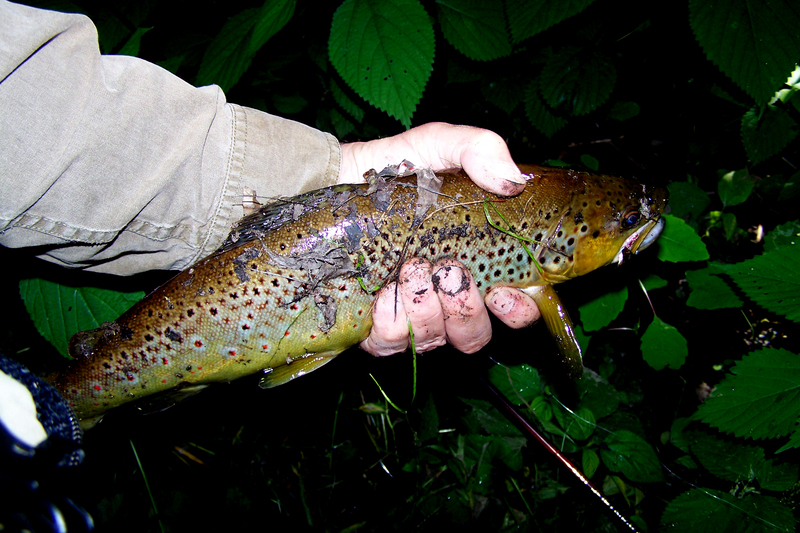 The water turns to chocolate and any trout inhibitions about chasing lures disappears. If it is muggy, it is down right stifling along the creek. You can taste the humidity breathing. By early summer the vegetation is always thick and dangerous. Nettles and poison ivy in particular so when you land a trout and need to go to the bank to unhook or field dress it – beware. Which brings me to last Saturday afternoon. We had a good rain in west Michigan on Thursday night. I guessed correctly my favorite creek might be flooded though it turns out not muddy, which can be good also, the trout can see lures from a good distance. That just means longer, more accurate casting is needed. There’s a good technique I haven’t mentioned before on fichigan. It paid off twice on Saturday and here’s the idea. 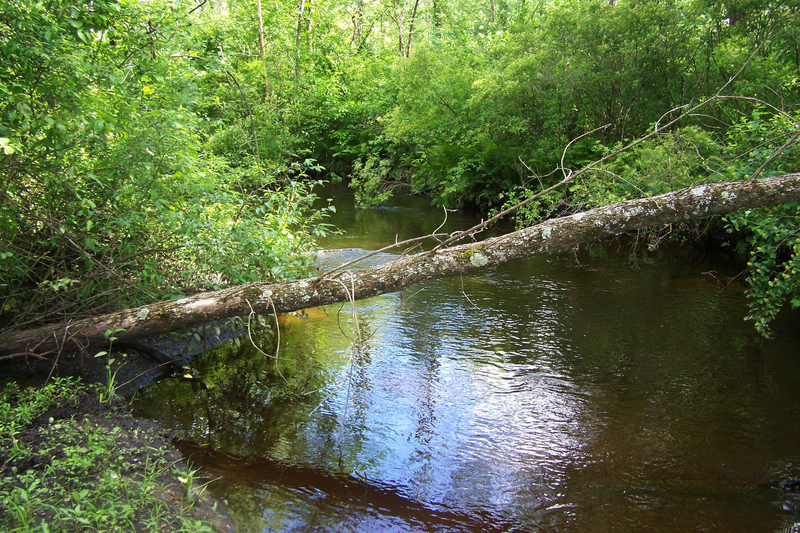 When the water is high, logs spanning the stream that are normally exposed, are submerged. These are good holding spots for trout and I typically cast to the back end (downstream side, note that I fish wading upstream) and hope the noise of the lure landing near the log will attract the attention of a trout. This often works, trout hear the splash and check it out. 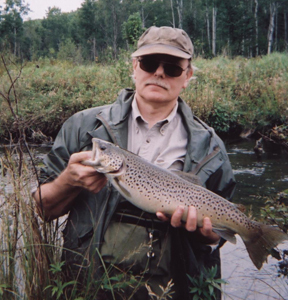 When a river or creek is flooded and I can see the water running over the top of logs I cast over the log with a floating minnow, lightly jerk it a few times so trout below the log see it coming, then I stop winding and let the lure float to the surface so it goes over the log. As soon as it is over the log I start winding again and wait for an explosion. 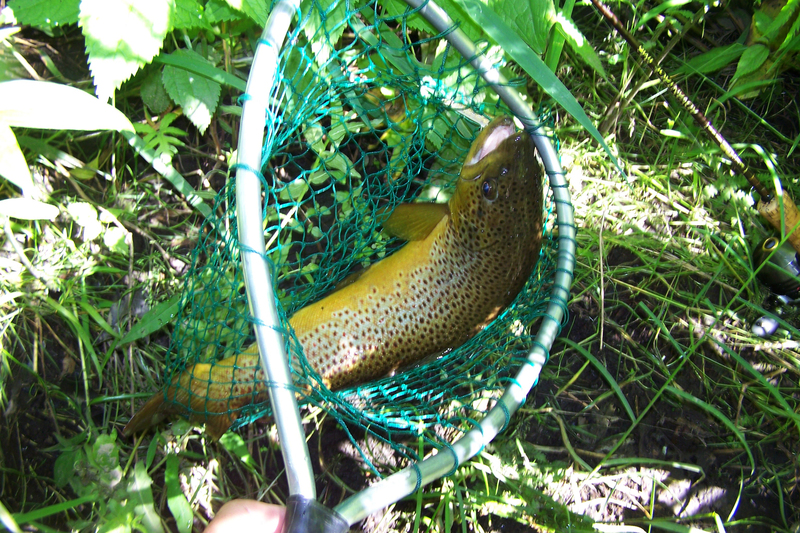 You may not be able to tell from the photo but the trout in the net measured 22 inches. That was my first fish of the day. I admired it, took the photo, unhooked it and turned it loose. It took the lure within a second or two of floating over the log. I moved upstream casting the bank and working the cover and came to another submerged log. It looked like maybe an inch or less water running over the log but that’s enough. I did an underhand flip cast placing the lure a few feet upstream of the log, twitched the lure on the surface, watched it float over and started reeling. Same thing, another explosion. This one was smaller but probably 17 or 18 inches. Here’s the other lesson about small creeks. I pulled him up on the bank and felt the familiar sting of nettles on my index finger. I stuck my finger in the soothing cold water and rubbed it on my waders to wipe off any oil or whatever it is that provides nettle sting. That helped. I released the trout unharmed and kept fishing. Later toward evening I noticed a small spot of rash on the wrist of the same hand. Poison ivy, but the patch is about the size of a quarter so I was lucky. Also picked up a tick, buried in my leg. Here again, I take precautions for that too. I sprayed my main long sleeve fishing shirt with Permethrin this spring, doused it good, but the tick likely fell in my waders and crawled up the leg. Back to fishing. I caught several more trout, not large, but always exciting. I didn’t keep any but maybe next time. I only fished half the stretch. The last time I went up this “creek” I saw a two footer jump clean out of the water. I saved the last half of the stretch for the next downpour.